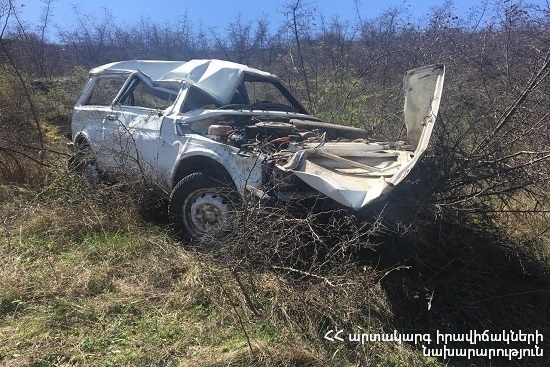 On April 12, at 14:20 information was received to “911” service that a car accident had occurred in Movses village, Tavush Province. The rescuers’ help was needed. The operative group of the base of Movses village of the civil defense forces of the Civil Defense Department of the rescue service of MES of RA dispatched to the scene. It turned out that “VAZ-2121” car (driver A. A. born in 1945) had run off the roadway and rolled over into a canyon (about 400 m) in “Sharshtaghi balan” field of Movses village. The rescuers moved the driver and a passenger Sh. M. born in 1957 to ambulance car. The casualties were hospitalized to the military hospital of Berd town. The driver died on his way to hospital. According to doctors the other casualty was in satisfactory condition. The rescuers closed the gas valve of the car.